Keep up the good work and we’ll reach our fitness goals one step at a time. Located on Main Street near Schat’s Bakery, InTouch MicroSpa has been passionately serving the Mammoth community for 24 years. InTouch MicroSpa offers waxing, facials, and other body treatments, including a wide range of massage. All treatments are centered on quality service, as the therapists strive to make your experience exceptional. It’s no “fluff and buff experience” as co-owner Carrie Meyers puts it. With her husband Dan, Carrie has been operating the business since 1989. Both of them are licensed massage therapists. As some of the original members of Mammoth Track Club, Carrie and her husband are no strangers to the stress, wear and tear that an athletic life style breeds. Carrie is currently preparing for her first Olympic distance triathlon, while Dan recently completed the Bishop 50 Miler. They understand the tremendous benefits that massage offers in promoting healing. Ideally, Carrie believes that athletes should receive massage therapy once a week to flush the legs and stay ahead of injuries before they arise. Realistically though, people should come in every 2-4 weeks for treatment. At InTouch, you are welcomed into a beautiful and intimate setting where you will receive focused attention and superior therapeutic work to assist in recovery and injury prevention. Although there is a mix of clients that frequent the spa, the main reason people come in is for pain reduction. From addressing overwork in the office to overuse in athletics, InTouch is adamant about providing personalized service to tackle anyone’s needs. Helping people feel good is just one of the many satisfactions Carrie finds in running the day spa. 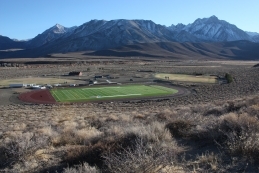 To show support for the Mammoth Track Club, InTouch would like to offer MTC members $15 dollars off for massage work from April to December 15th of 2013 and a $20 dollar discount during this month of June. You can book appointments at 760-934-2836. The treatments will not disappoint. 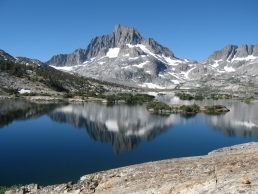 Make InTouch your next destination after a long day of work and play in Mammoth. Mammoth Track Club would like to introduce its newest member Josphat Boit. Boit joins the team with an already impressive running career and comes to Mammoth with the goal of contending for a spot on the 2016 US Olympic Marathon Team. The Eldoret, Kenya native made a name for himself during his two year stint at the University of Arkansas, where he was a 2-time NCAA Champion and an 8 time All American. His individual 5,000 and 10,000 meter victories at the NCAA Championships led the Razorbacks to two NCAA National titles. JB holds personal bests of 13:17 and 27:40 at the two respective distances. In Cross Country, Boit captured back-to-back SEC titles. His second 8k title, won in 22:59, shattered the course record. His performances earned him back-to-back SEC Cross Country Athlete of the Year honors. Since graduation Boit’s focus has turned to the roads where his dominance continues. Most recently, he was the top American at the Lilac Bloomsday Run and runner up at the US 25k National Championships in Grand Rapids, MI in a time of 1:14:34. In the past year and a half, Boit has captured titles at the Rock ‘n‘ Roll Mardi Gras Half Marathon, the Go St. Louis Half Marathon, Rock ‘n’ Roll St. Louis Half Marathon, the Shamrock 8k and the Tulsa Run 15k. Boit made his marathon debut in 2011 at the Honolulu Marathon, taking third in 2:15. Outside of training and racing, Boit has coached a Masters‘ recreational running team, was a volunteer coach for the University of Arkansas at Fayetteville and the University of Arkansas Little Rock, and has coached new runners participating in the Susan G. Komen Race for a Cure. Boit reaches out to youth by speaking to them about running and hard work. Boit’s wife, Shenan, joins him in Mammoth. She can be seen at team practices, biking along and helping pace the elite members during their workouts. Shenan has taken to the snowy slopes of Mammoth and finds herself an active member of the community. 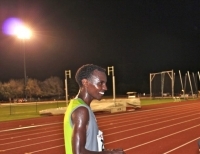 Watch out for Boit as he makes a name for himself as one of the country’s premier distance runners. Mammoth Track Club is excited for him to pursue his goals with us! Welcome Boit and Shenan! Academically, Adam continues to dedicate himself to the highest degree. His proudest moment came when he was admitted into Tau Beta Pi—an Engineering Honor Society. It had been a goal of his since his freshman year. And to top things off, he was voted President of Gonzaga’s chapter this upcoming fall. Adam is currently spending the summer in Spokane, Washington with an internship at KeyTronic. In the future, he hopes to return to his roots in California by either working or attending graduate school. He recently raced at the Lilac Bloomsday 12k (50,000 runners) in Spokane and has committed himself to increasing his competitiveness in triathlons. He will complete his first half-ironman this summer. Mammoth Track Club wishes Adam all the best in his final year at Gonzaga; great things await him. Join us at the track every Tuesday morning at 7am for practice! Josphat Boit earned runner up at the 25K National Championships. Deena Kastor is selected to the US marathon team to compete in the World Championships in Moscow this summer. Fun fact: This will be Deena's 19th US team. As the weather warms, it is always a challenge to stay hydrated. Try enhancing the flavor and electrolytes to your water by adding sliced fruit like rings of oranges, lemons, limes and peeled pineapple, or vegetables and hebs, like cucumber and mint. 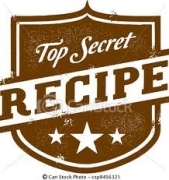 Keep a pitcher of this infused water in your refigerator for up to 2 days. Enjoy the cooling effect of the water after a run. Be createve with your combinations and indulge in the fruits afterwards. 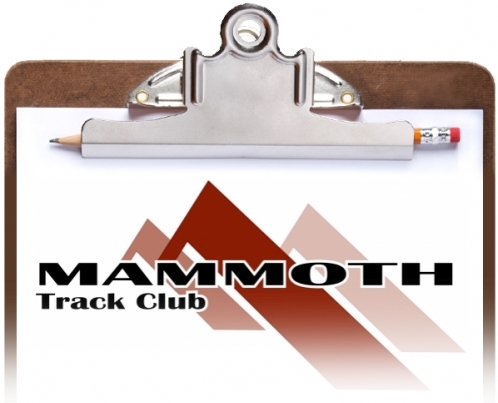 Copyright © 2013 Mammoth Track Club All rights reserved.